Travel Accident Insurance If you suffer a loss as a result of an accidental bodily injury sustained while occupying a common carrier, you are eligible for this coverage. Car Rental Insurance If your rental vehicle is damaged or stolen while rented out in your name, you are covered up to the vehicle’s actual cash value plus valid loss of use charges. This insurance plan also includes coverage against the theft of, or damage to, your personal effects, as well as any loss resulting from an accidental bodily injury sustained while in the rental car. This insurance plan covers you, your spouse and dependent children against the accidental loss of life, limb, sight, speech or hearing while occupying a common carrier or while at the airport, terminal or station at the beginning/end of your trip. 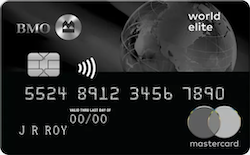 The full amount of the passage fare must be paid for using your BMO World Elite MasterCard and/or your earned loyalty points, and the loss must occur within 1 year of the accident in order for coverage to apply. One quarter of the benefit amount ($125,000/$25,000) is payable for the accidental loss of the thumb and index finger of the same hand. Call MasterCard Travel Accident Insurance at 1-800-337-2632 (Canada or US) immediately or as soon as reasonably possible. This insurance plan covers you in the event that a) your rental vehicle is damaged or stolen, b) your personal belongings are damaged or stolen while in the rental vehicle, or c) you suffer a loss as a result of an accidental bodily injury sustained while occupying the rental vehicle. You are covered for rental vehicles with a Manufacturer’s Suggested Retail Price (MSRP) up to $65,000 for damage to or theft of the vehicle, valid loss of use charges, and reasonable towing charges. This plan also covers the actual cash value of your personal effects up to $1,000 per insured person for a maximum of $2,000, to protect against theft or damage of your belongings while they are in the rental car during the rental period. You must make a reasonable effort to protect your personal effects, and benefits are not payable if you lose your personal effects as a result of a mysterious disappearance or if you can’t provide evidence of a forced entry. If you, your spouse or your dependent child suffers any of the losses below while occupying a rental car, you are eligible for the corresponding benefit amount. The maximum benefit payable for any one accident is $300,000. Call Allianz Global Assistance at 1-877-704-0341 (Canada or US) within 48 hours of a claim or as soon as possible. This insurance plan covers most items purchased anywhere in the world for 90 days from the date of purchase. If the item is stolen or damaged, it will be repaired, replaced or you will be reimbursed for the purchase price. Only items that were paid for in full with your BMO World Elite MasterCard or obtained through the redemption of loyalty points are covered by this plan. Note: The combined lifetime maximum of purchase security and extended warranty insurance benefits is $60,000 per account. Call the Allianz Global Assistance Operations Centre at 1-877-704-0341 (Canada or US) immediately after learning of any loss or occurrence to obtain the appropriate claim forms. This insurance plan either doubles the length of the item’s manufacturer’s warranty coverage or extends it by 1 year—whichever is lesser. This coverage applies automatically to items with warranties that are 5 years or less. Items with warranties greater than 5 years must be registered with the Allianz Global Assistance Operations Centre within 1 year of the date of purchase in order for coverage to apply. This insurance reflects all terms and conditions of the original manufacturer’s warranty and benefits end automatically when the original manufacturer ceases to carry on business for any reason whatsoever. If you have to cancel your trip before it has even started, you will be reimbursed for the portion of your trip which is prepaid and non-refundable or non-transferable to another date, up to $2,500 per person and up to $5,000 for the entire trip. The primary cardholder, his or her spouse and dependent children are all eligible to receive benefits under this insurance. The coverage period starts on the date that your trip is booked with a travel agent/supplier and runs either until your scheduled departure date or the cancellation date—whichever is earliest. Note: Coverage applies only when the full or partial cost of the trip is charged to your BMO World Elite MasterCard. Cancel your trip and then call the Allianz Global Assistance Operations Centre at 1-877-704-0341 (Canada or US) within 48 hours of the event that caused you to cancel your trip. Failure to do so may reduce the amount payable. If, after you’ve already departed, your trip is unexpectedly cut short or delayed, you will be reimbursed for the extra cost of a one-way economy airfare back to your departure point or to your destination point, and for any unused non-refundable land and travel arrangements up to a maximum of $2,000 per person. If you are delayed in reaching the next part of your trip as a result of one of the covered causes for interruption, your necessary and reasonable costs of commercial accommodation and meals are also covered up to $150 a day per insured person. The primary cardholder, his or her spouse and dependent children are all eligible to receive benefits under this insurance. The coverage period starts on the date that you depart for your trip and runs until you return to your point of departure. Call the Allianz Global Assistance Operations Centre at 1-877-704-0341 (Canada or US) within 48 hours of the event that forced your trip to be interrupted/delayed. Failure to do so may reduce the amount payable. In the event that your scheduled arrival or departure is delayed for 6 hours or more, you will be reimbursed up to $500 per trip for reasonable, additional accommodation and travelling expenses incurred while delayed. Note: Coverage applies only when the full or partial cost of the trip is charged to your BMO World Elite MasterCard and expenses must be incurred as a result of the delay. Call the Allianz Global Assistance Operations Centre at 1-877-704-0341 (Canada or US) immediately and notify them of your circumstance. You will be required to submit original, itemized receipts for any expense that you incur as a result of the delay as well as a report from the common carrier verifying the cause and duration of the delay. In the event of a medical emergency occurring during the first 21 days of a trip outside of your home province, you will be covered up to $2,000,000 for any medical expenses incurred. If an insured person has a medical emergency at the end of the trip’s coverage period, or an insured person misses their scheduled return date due to a delay either of a common carrier or of their personal means of transportation, then coverage is automatically extended by 3 days. These benefits cover reasonable and customary charges for the following services arising from a medical emergency. This insurance plan covers the actual cash value of your baggage and personal effects up to $750 per person and up to a maximum of $2,000 per trip for the loss, damage, theft, and fire or transportation hazards to your luggage and/or belongings used by you during the trip. Coverage is limited to $500 per item, and camera equipment and jewelry are each considered one item. You, your spouse and dependent children are all eligible for this coverage. Call the Allianz Global Assistance Operations Centre at 1-877-704-0341 (Canada or US) immediately and notify them of your circumstance. If your checked baggage, or that of your spouse or dependent child, is delayed by more than 12 hours while you are en route to your final destination, you will be reimbursed up to $200 per person and up to an overall maximum of $2,000 per trip for the purchase of essential items until your baggage arrives. Essential items must be purchased before your checked baggage is returned and no later than 36 hours after you’ve arrived at your destination.